Consumer prices were unchanged in January, providing more evidence that tariffs on steel, aluminum, and goods from China have not taxed American consumers. The Department of Labor’s consumer price index was up just 1.6 percent in January compared with a year ago. That’s actually a slowdown in inflation compared with the prior months even though the Trump administration imposed a 10 percent tariff on $200 billion of Chinese imports in October. Excluding volatile food and energy doesn’t change the picture very much because core inflation was also very low. Core CPI climbed just 0.2 percent for the month, exactly as it had in the prior three months, and is up just 2.2 percent from a year ago. That is in-line with December and November’s 2.2 percent, October’s 2.1 percent and September’s 2.2 percent 12-month increases. The Federal Reserve says it targets inflation of 2 percent. If tariffs were acting as taxes on consumers, prices would be higher. At the very least, prices on items subject to tariffs would be higher. But instead, we’ve seen month after month of very muted inflation. Prices of most items subject to the metals and China tariffs have either declined or advanced on pace with or slower than inflation and wages. In other words, prices for most tariff impacted items fell in inflation-adjusted terms. Only major appliance prices are clearly showing evidence of tariff pressure, and there is some mixed evidence of pressure on autoparts. Take the price of soup, canned fruits and vegetables, and beer. 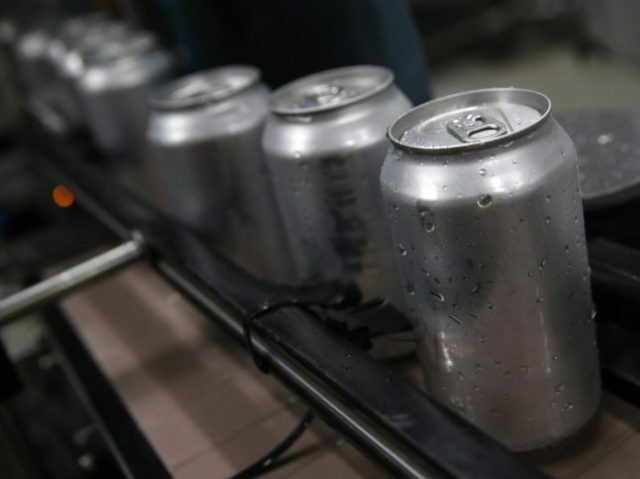 Breitbart News has been closely following the prices of soup and beer ever since Commerce Secretary Wilbur Ross confronted critics of tariffs back in March on CNBC while holding up a can of Budweiser and a can of Campbell’s soup. The prices of these items, Ross argued, would hardly be affected at all by the 10 percent tariff on aluminum. Critics had argued that the rising price of the metal would win up pinching consumers by raising prices in the grocery aisle. The price of soup rose a seasonally adjusted 0.3 percent in January. Compared with a year ago, soup at home–largely canned soup–are down 0.8 percent compared with a year ago. No tariff pressure there. Prices of canned fruits and vegetables, another category of consumer goods that was widely predicted to see prices rise because of increased aluminum costs, were unchanged in January. Compared with a year ago, this category’s prices also barely rose, ticking up just 0.7 percent. The price of beer consumed at home was rose 0.1 percent and is up 2.2 percent compared with a year ago. This is not all cans, of course. But since cans and bottles are close substitutes, the overall price level of beer at home is the relevant category. (And the only one the government tracks.) If canned beer were rising but bottled beer were falling by equivalent amounts, keeping the overall price category unchanged, consumers would be no worse off. In any case, the price is up right in line with overall inflation, suggesting tariffs have not had the predicted effect of pushing up beer prices. The upward pricing pressure on beer consumed in bars and restaurants, which is notable because the price of beer kegs has reportedly gone up because of the aluminum tariffs, is no longer showing up. Beer consumed outside of the home is up just 1.6 percent compared with a year ago, a deceleration from December and November. For the month, the price of beer consumed outside of the home fell 0.1 percent. Car and truck prices also show no signs of tariff-driven inflation. Prices of new cars rose 0.1 percent in January after being flat in December and November. Compared with a year ago, car prices are up just 0.4 percent. That’s a pretty steep deceleration in price gains, down from a 0.8 percent annual gain in November and a 1.2 percent annual gain October. The price of new trucks rose 0.4 percent in January. Compared with a year ago, truck prices are down 0.2 percent, the third straight month of deflation. Many of the categories of consumer goods that are largely manufactured abroad also saw steep declines. Tools and hardware were another focus for those promoting the “tariffs are taxes on consumers” narrative. Prices on these rose 0.9 percent in December. Compared with a year ago, tools and hardware prices are up just 2.1 percent. The prices of televisions fell again in January, dropping by a seasonally adjusted 0.6 percent. This is the sixth consecutive monthly decline for televisions. Compared with a year ago, television prices are off 16.8 percent. This steep decline may reflect foreign manufacturers competing with each other for market share by dumping televisions on the U.S. market. (There are no real domestic manufacturers for anti-dumping regulations to protect so it is unlikely the Commerce Department will take any action here.) It may also reflect recent sluggishness in new home sales since families buying homes typically purchase televisions as well. But it certainly shows that predictions televisions prices would shoot up were wrong. The price of computer hardware and phones were predicted to see upward pressure from tariffs on China. But computers and related hardware prices fell 0.5 percent in January. Compared with a year ago, they are down 3.4 percent. Phone prices fell again, for at least the fifth consecutive month, and are now down 14.5 percent compared with a year ago. Note that mobile phones were excluded from the first two rounds of tariffs. Earlier this year, prices of washing machines were up sharply due to specific anti-dumping tariff imposed in January of last year that were intended to drive up the price from artificially depressed levels. Those washing machine gains, however, are tapering. Prices of laundry equipment were up just 7.2 percent compared with a year earlier, down from an annual gain of 15.5 percent in November. The broader major appliance category, however, is once again seeing higher prices. On a monthly basis, prices rose 1 percent. Compared with a year ago, prices are up 9.7 percent. Other appliances are up just 4.5 percent year-over-year. This likely reflects increased consumer demand due to rising wages and low unemployment but may also reflect some tariff pressure. The tariffs on Chinese-made goods also do not seem to have had much of an effect on consumer prices. Initially, these applied to $50 billion of imports from China and were largely focused on technology goods. In late September, however, the China tariffs were broadened to cover $250 billion and a wider array of consumer goods. The prices of furniture and bedding, one of the largest categories of China-made imports, rose just 0.3 percent in January and are up just 1.3 percent annually. Toys, another big China import category, saw prices fall by 0.1 percent in January. For the year, toy prices are down 7.6 percent. Sports equipment prices fell 0.3 percent, reversing two months of rising prices and returning to the pattern of falling prices that had been seen until November 2018. Compared with a year ago, however, sports equipment prices are down 3.0 percent. Clothing prices were up 1 percent in January compared with December. On an annual basis, clothing prices are up just 0.1 percent. Shoe prices rose a sharp 2.5 percent, with children’s shoes rising 4.5 percent for the month. Compared with a year ago, shoe prices are up 2.3 percent. Note, however, this is not a category of consumer goods subject to the existing China tariffs. So this may just be ordinary inflationary pressure driven by rising wages and strong employment numbers. Auto parts prices rose 0.7 percent in January after falling by 0.8 in December and are up 3.2 percent compared with a year ago. It’s possible that the metals tariffs or China tariffs or both may be putting some additional pressure on these prices, although the month-to-month volatility makes that a speculative explanation at best. The picture will become clearer over time. Once again, the consumer price data has largely demolished the notion that tariffs are squeezing consumers. Prices pressures remain muted, with increases on heavily imported and newly tariffed goods only showing up in appliances and autoparts. Meanwhile phones, computers, and especially televisions have plummeted in price. Beer, soup, and cars show no tariff pressure at all. This suggests that if tariffs are having any effect at all it is not to raise prices for households generally but to shift prices between items, so that major appliances rise while televisions and computer fall. That does not mean that prices will remain low or tariffs will never push prices up. It just demonstrates that they have not yet done so. The low prices may indicate that the burdens of tariffs are falling on foreign producers. This can happen when export prices fall in reaction to tariffs, either because foreign manufacturers seek to maintain market share but discounting their goods or because foreign currencies decline against the dollar.